UK envoy: "I have seen no willingness on their part to engage in negotiations"
(CNN) -- North Korea is demonstrating an unwillingness to resume negotiations on its nuclear activities, the British ambassador to the country said Friday. 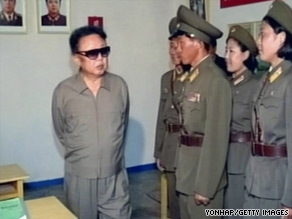 There have long been persistent rumours about Kim Jong Il's poor health (left). Peter Hughes spoke to reporters from the North Korean capital of Pyongyang a day after the country test-fired four short-range missiles off its coast. A U.S. official described the launches as "provocative acts." "I have seen no willingness on their part to engage in negotiations whatsoever," Hughes said of the North Koreans. The six-party talks on North Korea's nuclear program have been stalled for more than a year. The North said in April it would walk away from the talks and restart its disabled nuclear reactor. The U.N. Security Council voted this month to expand and tighten sanctions on North Korea. Such sanctions can be effective, Hughes said, even if the North is unwilling to talk. "Sanctions, together with a wider framework of measures, we hope, will put sufficient pressure on the DPRK to reconsider its position on negotiations," he said, referring to North Korea's official name. But he conceded, "The North Koreans themselves have said that they will not give up their nuclear weapons until such time as there is nuclear disarmament" by all nations. South Korea's Defense Ministry confirmed three test-firings of short-range missiles off the North Korean coast Thursday, and South Korea's Yonhap News Agency later reported a fourth. A U.S. intelligence official confirmed the test firings. They came amid heightened tensions on the Korean peninsula. North Korea conducted a nuclear test in May, fired test rockets and threatened U.S. and South Korean ships near its territorial waters. Hughes was also asked about the condition of North Korean leader Kim Jong Il, who last appeared in public in April. Kim is widely reported to have suffered a stroke in August 2008, and there have long been persistent rumors about his ill health. Hughes said he could only speak about what he saw at Kim's appearance in April. "It is clear from that, that he is frail, that he has aged very quickly, and that he has lost a considerable amount of weight," Hughes said. "That is all I can say at the moment. We have no other way of accessing any information about his health."